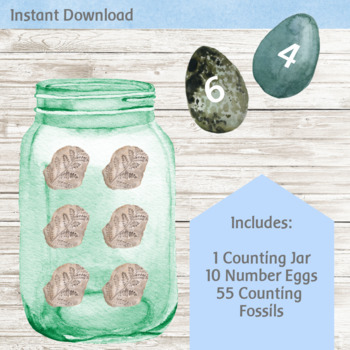 Our counting jar, counting fossils and dinosaur number eggs can be used together or separately, in a variety of ways, to explore early numeracy. 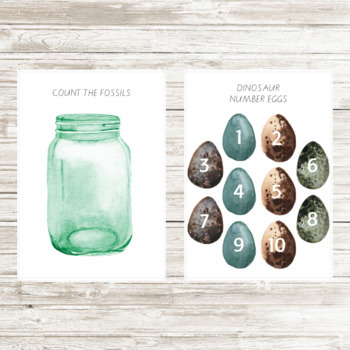 Choose a number egg and then have your child place that number of fossils into the jar, or do the reverse and place some fossils in the jar and ask your child to choose the matching number egg. 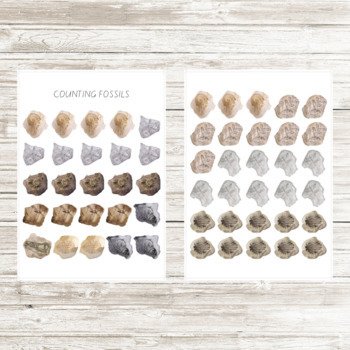 Line the number eggs up and ask your child to line the correct number of fossils beside them. You could even roll a dice (instead of choosing a number egg) to select the number of fossils to count into the jar. This printable product is a digital download. Once you have completed your purchase you will receive a link to download the product in PDF format. No physical product will be sent. To make your printouts look their best, I recommend printing them on the highest quality print setting. I also highly suggest printing on card, rather than paper. I use 200gsm board. Using card will make the print quality higher, the printouts more durable and the smaller pieces easier for little hands to handle. If you have access to a laminator, laminating your printouts is a great way to preserve them so that you can use them over and over again. The purchase of this product is intended for the sole use of the purchaser. No part of this publication may be transferred or redistributed.